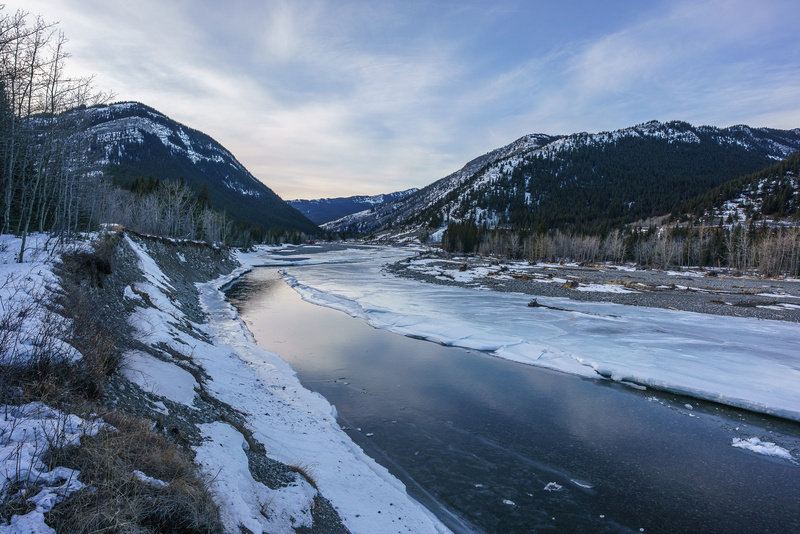 Difficulty Notes: The hardest part of this hike is crossing the Highwood River and the occasional stretch of bushwhacking. Also the interminable number of false summits is challenging. With avalanche conditions at “considerable” in the alpine, we had several different options for the weekend of January 21 2017. 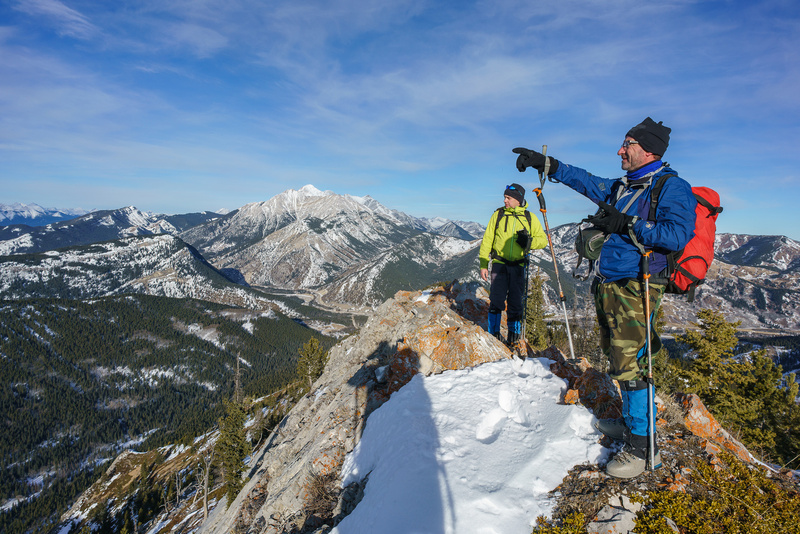 We could ski something below the alpine, go xcountry or resort skiing, or hike something in the front ranges. Dave Salahub had been trying to con Wietse into a day scramble up Zephyr Creek Hills (aka Miller Creek Hills) for a few years already. This was the perfect time to pounce on the idea yet again – and this time it stuck! To be honest, the only reason I agreed to the adventure was the cool sounding name and the fact that it would be my first summit starting with the letter “Z”. Sometimes it doesn’t take very much to get me off the couch. 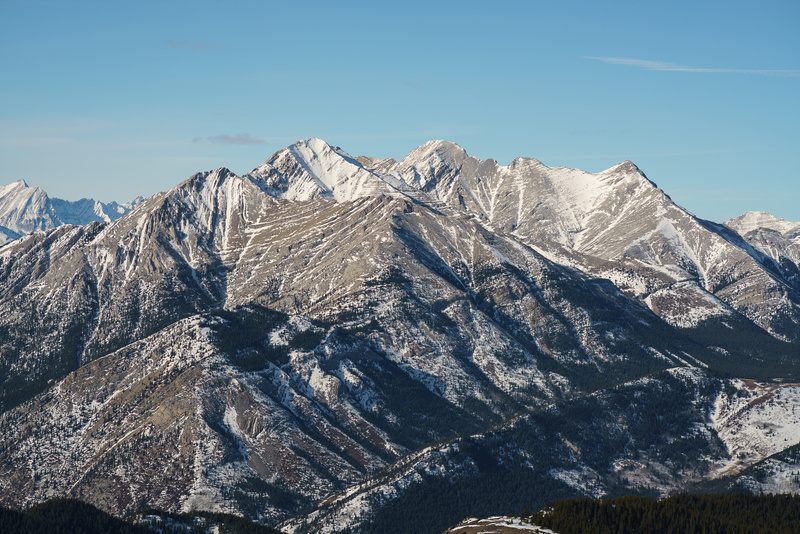 Note: There are a ton of names that can apply to all the ridges and small summits in this area. 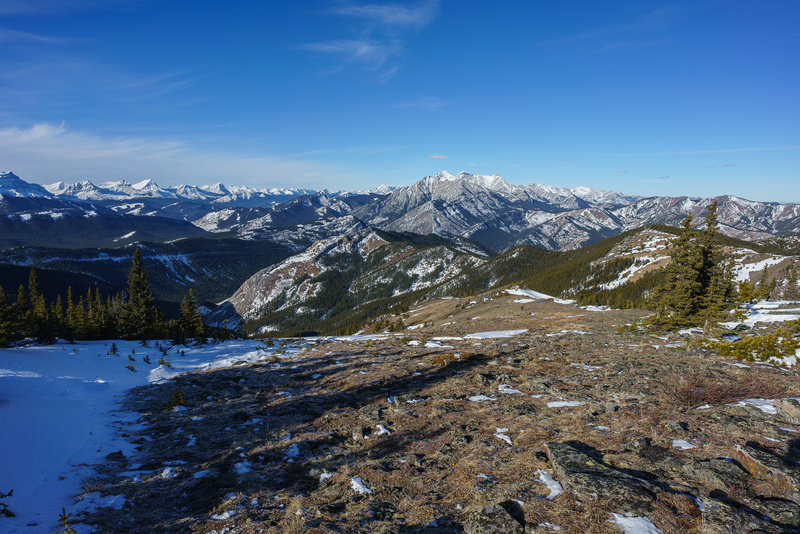 As a general overview, we ascended North Limestone Ridge to it’s south summit before crossing east to Miller Creek Ridge which we then followed south to the twin summits of Zephyr Creek Hills. 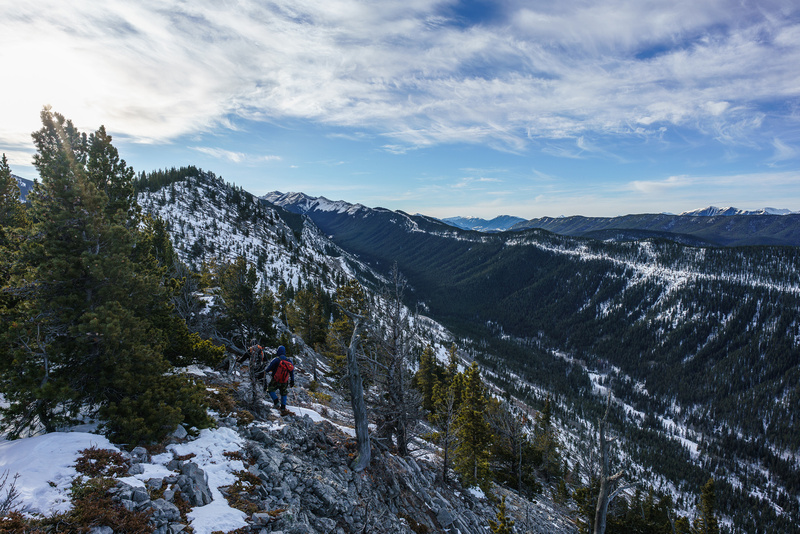 On return, we followed Miller Creek Ridge all the way back before dropping into the valley between North Limestone Ridge and another ridge to the east. Wietse, Bill, Dave and I met at the 37th street parking lot along hwy 22x at 07:00 and drove to the parking area along hwy 40 in Bill’s Jeep. We parked in a rather unofficial spot just off the highway on a gravel berm constructed after the 2013 floods along the Highwood River. 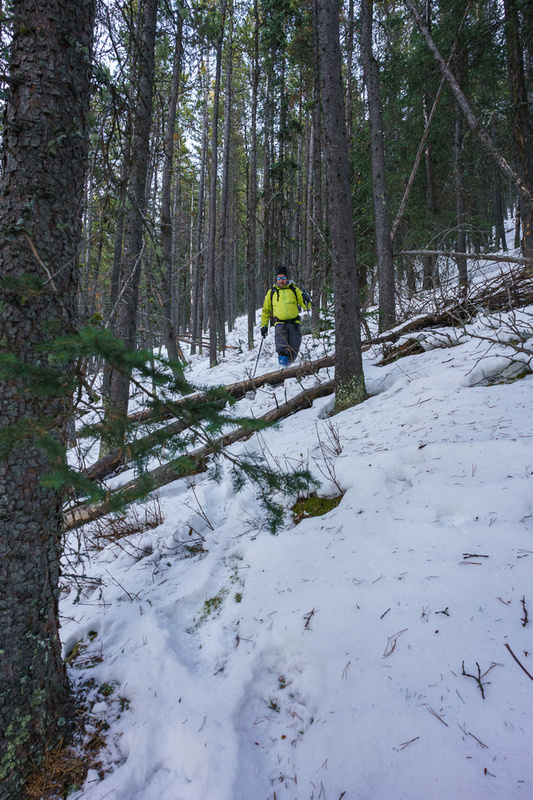 After looking at the small amount of snow surrounding the area, we chose to leave the snowshoes behind. For some reason it was bloody cold along the river! I mean, very cold. Wietse even got cold hands, which never happens. 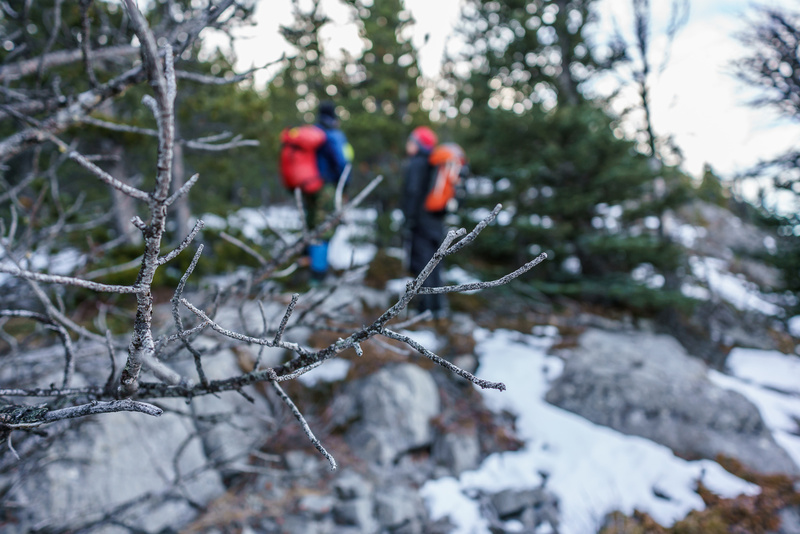 After donning our river crossing gear we shivered our way across a shallow Highwood River and put on our hiking boots in the shelter of a small group of trees. The wind was so biting, we didn’t waste any time before hiking towards the north end of the first ridge we were planning to hike, also called “North Limestone Ridge” by Gillean Daffern. 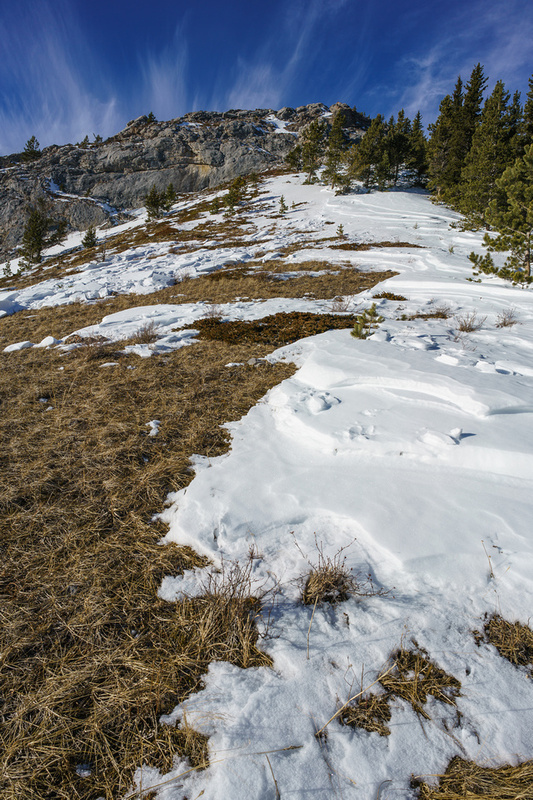 There was a surprising lack of snow along the entire North Limestone Ridge. 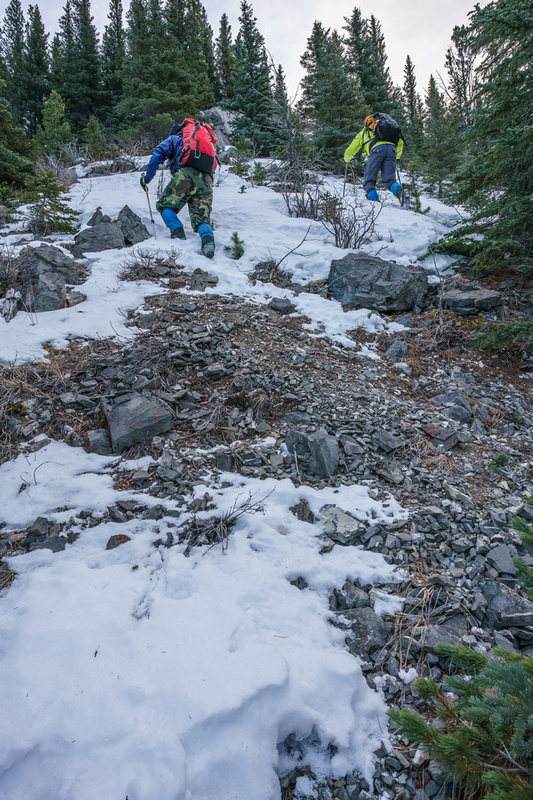 We grunted our way up the easy, lightly forested north end of the ridge before balancing up some nice rocky ridge sections and over many false summits (I think Bill counted 6 or 7 of them). 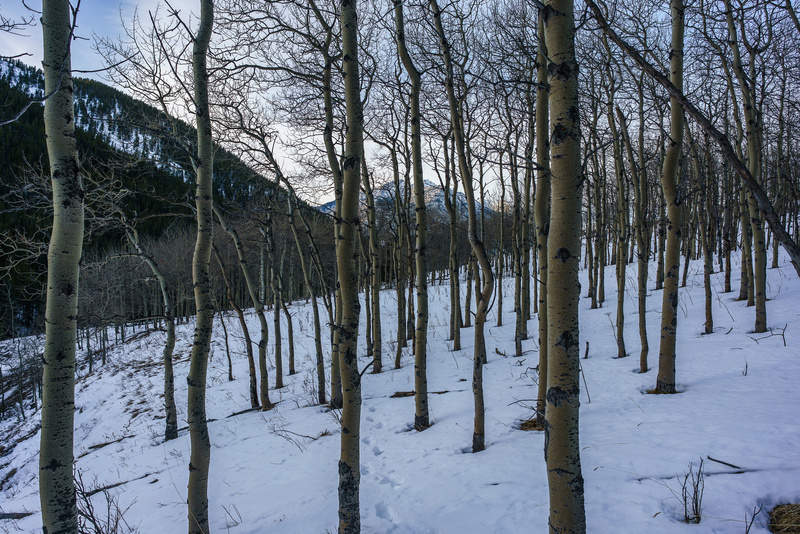 The weather was extremely pleasant for a late January front range hike. Despite starting out bitterly cold, we quickly warmed up and a complete lack of wind combined with a warm sun bolstered our moods considerably compared to our grumpy start along the river. 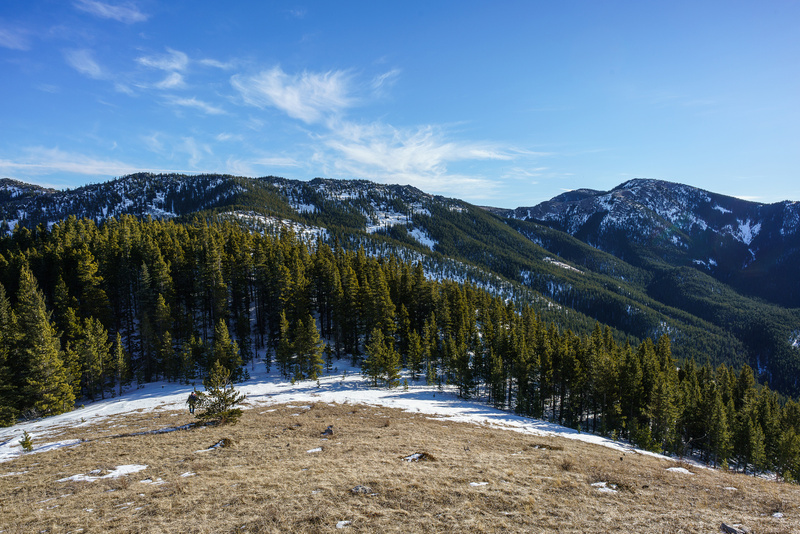 Usually when I do one of these front range hikes in the winter, it’s during a Chinook which means lots of wind and clouds covering the peaks to the west. 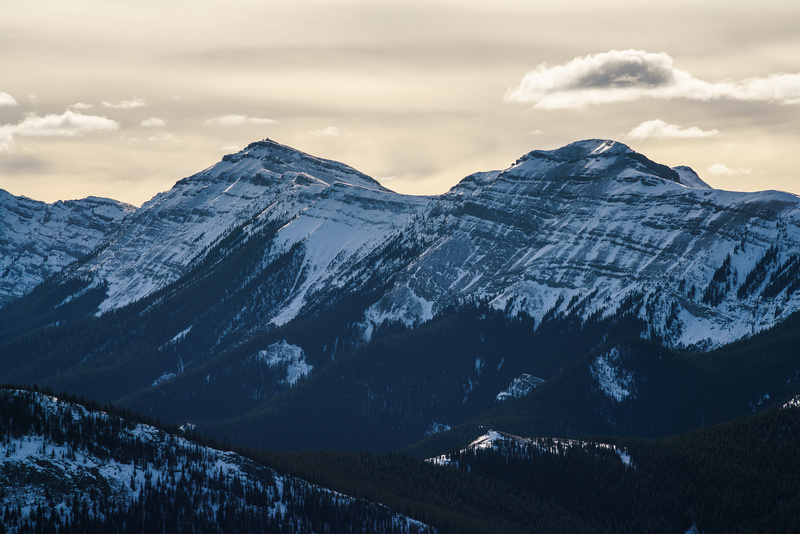 This particular day was not a Chinook, so our views to the High Rock Range were stunning all day. 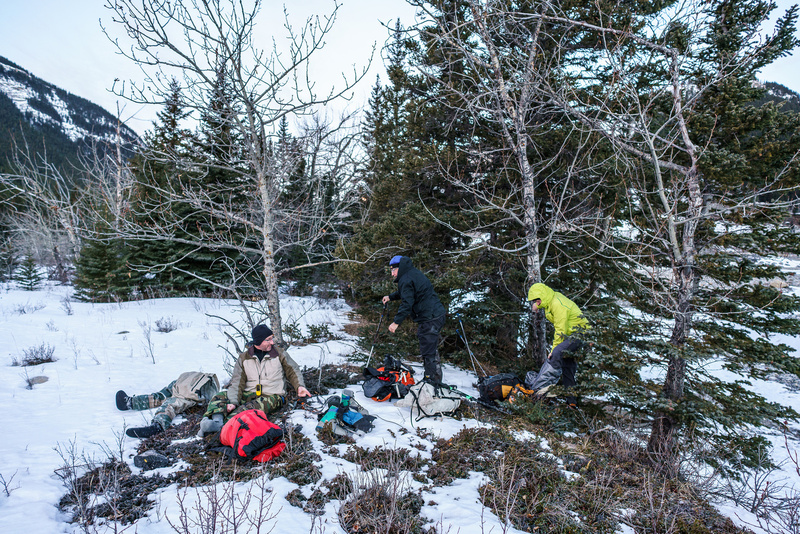 We topped out at the summit of North Limestone Ridge in windless, warm conditions and sat down to enjoy a well-deserved break. Our destination looked a long ways off yet – and we had to lose at least 80-100 vertical meters to get onto the proper ridge first. 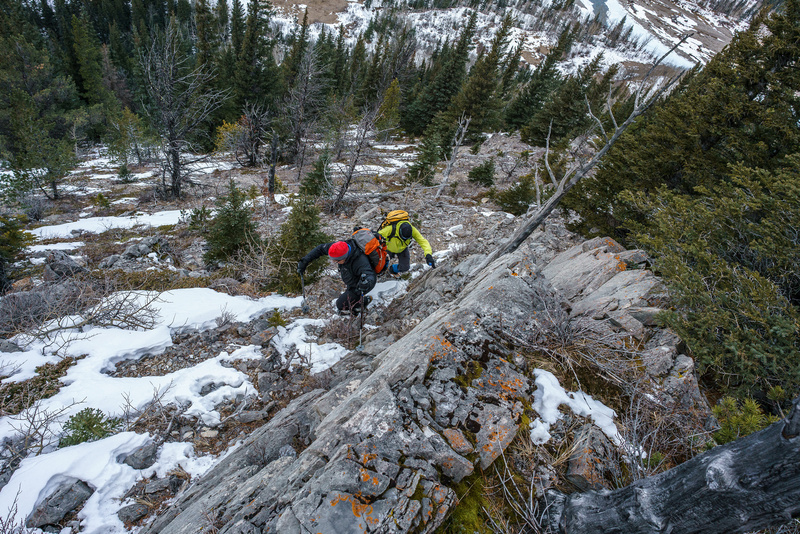 This traverse between North Limestone Ridge and the formerly known “Miller Creek Hills” was looking to be the mankiest stretch of our hike. Snow drifts had built up in the trees between the ridges and the hard crust was breaking down a bit in the warm sunshine. 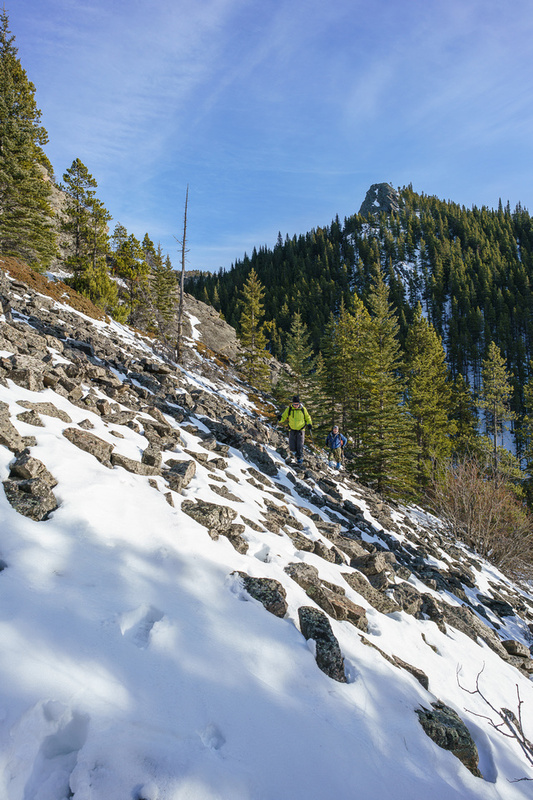 Dave and Wietse led the way quickly down the east face of North Limestone Ridge and I kicked steps up the deteriorating snow on the west face of Miller Creek Ridge. 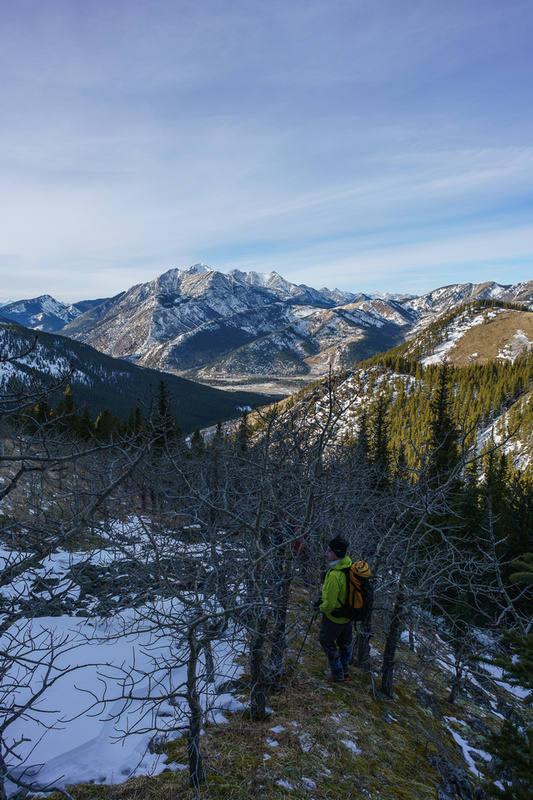 As expected, the hike towards Zephyr Creek Hills (or “Top 1” and “Top 2” as Gillean calls them) was long and involved some elevation gains and losses. The great views helped, as did the complete lack of wind on the ridge. I chose to stay right on the ridge crest for some easy scrambling, while Dave did a short detour through the trees at one point. After finally topping out on the second-to-last high point I was almost out of gas. I managed to somehow press onward down yet another col and up the final slopes to the high point. All I could think as I walked up to the giant cairn was, “Holy crap – I still have to go all the way back!!”. At least the views were good. I sat down for a break and waited for the others to arrive. 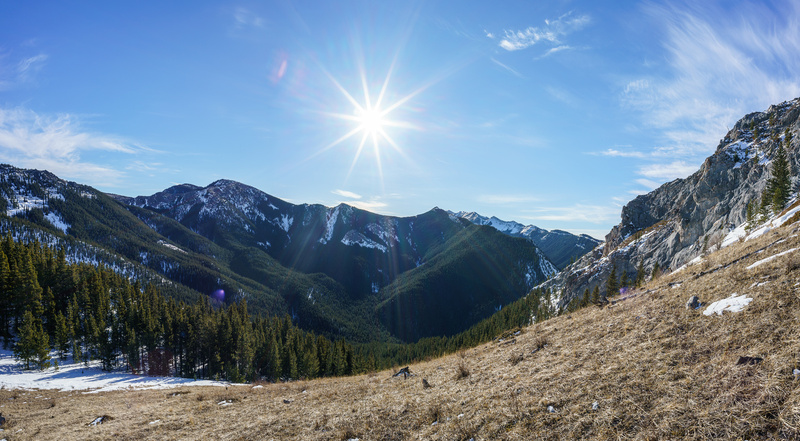 I cant remember a nicer day in the front ranges in late January. The lack of wind made things very pleasant. After around ten minutes, Wietse and Dave joined me at the summit. 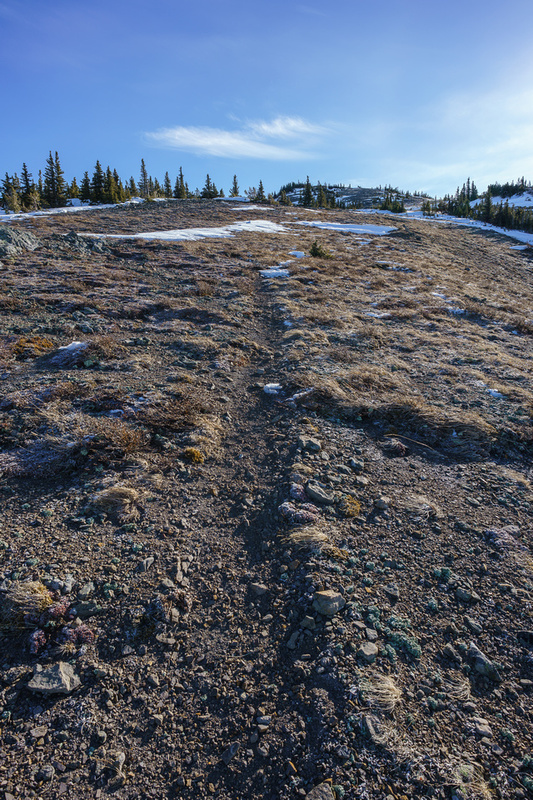 Bill decided he’d had enough fun for one day and started breaking trail back down our alternate descent route. We didn’t linger too long, as we still had a ways to go back and it was now well past noon. Our descent went quickly, but regaining all the high points to the end of the ridge was tiring. 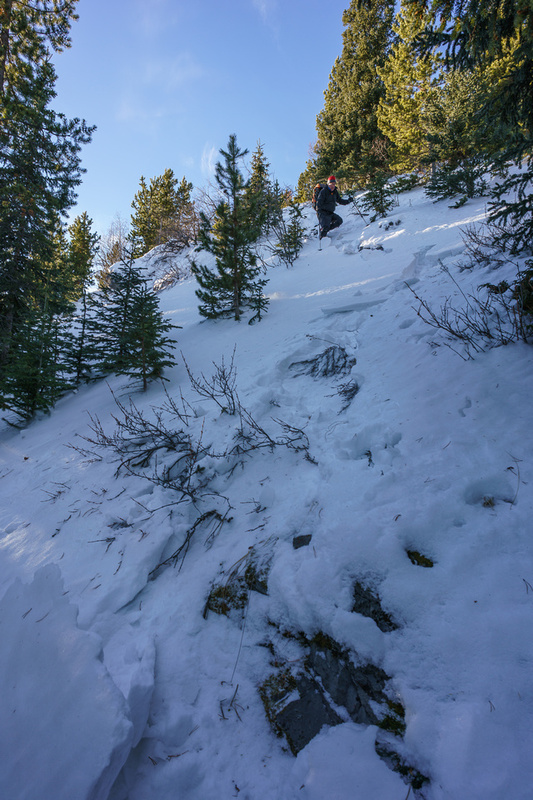 Once at the north end of Miller Creek Ridge we followed Bill’s tracks, plunging steeply down the east side of the ridge in crappy snow. 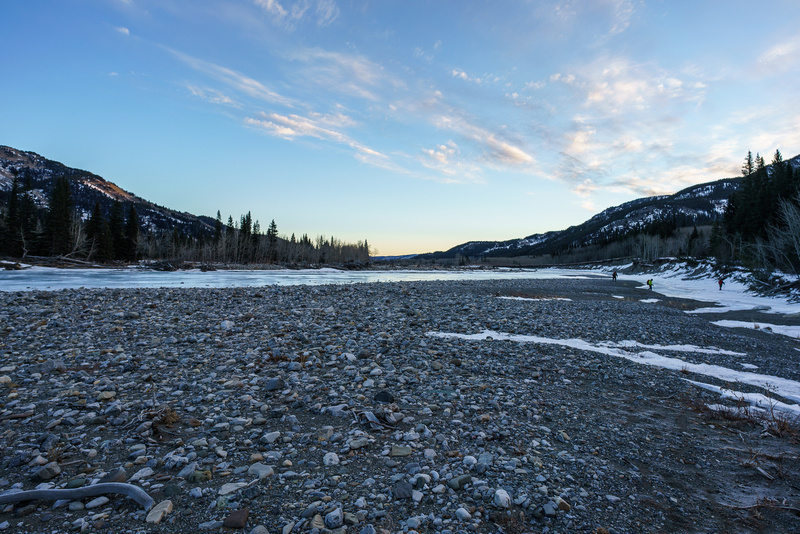 So why didn’t we follow Bob’s route back to the Highwood River? To make a long story short – we meant to! Poor Bill didn’t have a GPS track to follow and by the time he realized he was quite far off Bob’s route, it was too much work to get over to the more easterly ridge so he didn’t bother. 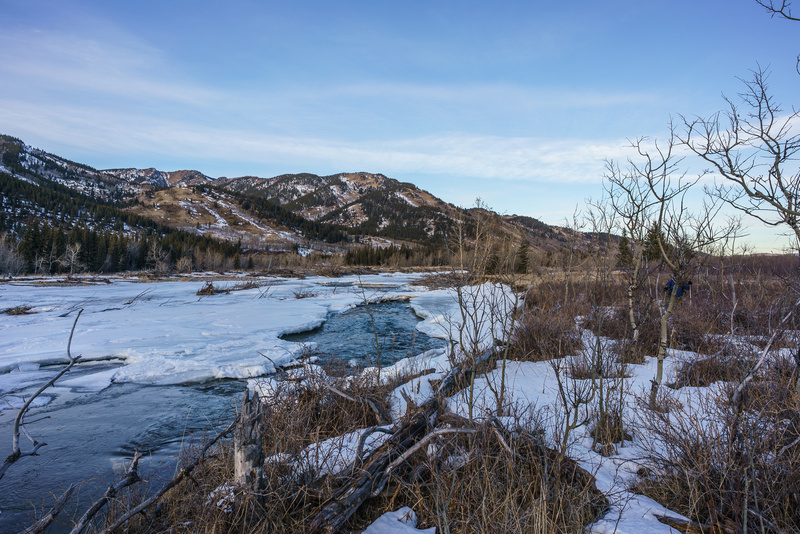 I have to say that Bill did an excellent job to stay out of the horrible mess in the creek just east of North Limestone Ridge and eventually we intersected Bob’s preferred route before finally stumbling out at the Highwood River. We followed the south bank of the river for about 1km before donning our river crossing gear and returning to the truck. Our round trip time of 8 hours was not spent messing around – we moved pretty quickly and steadily all day. I enjoyed this outing. 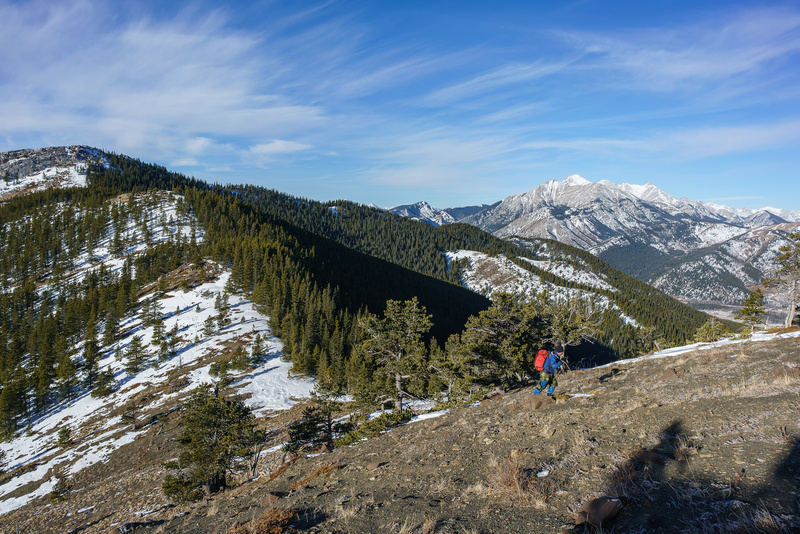 It’s nothing more than an easy scramble or hike (depending how close to the ridge you wander), but on a windless, warm day in January it was all I needed to boost my soul for another week in the concrete jungle. And at the end of the day – isn’t that what it’s all about? 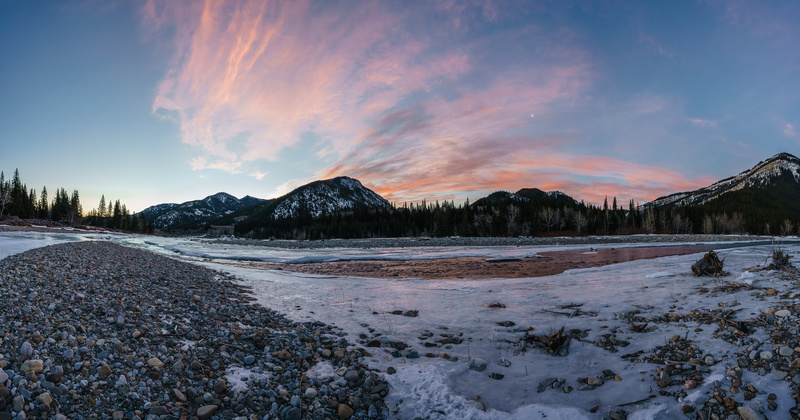 Sunrise views along the Highwood River. The north end of North Limestone Ridge is the second ridge from left here. 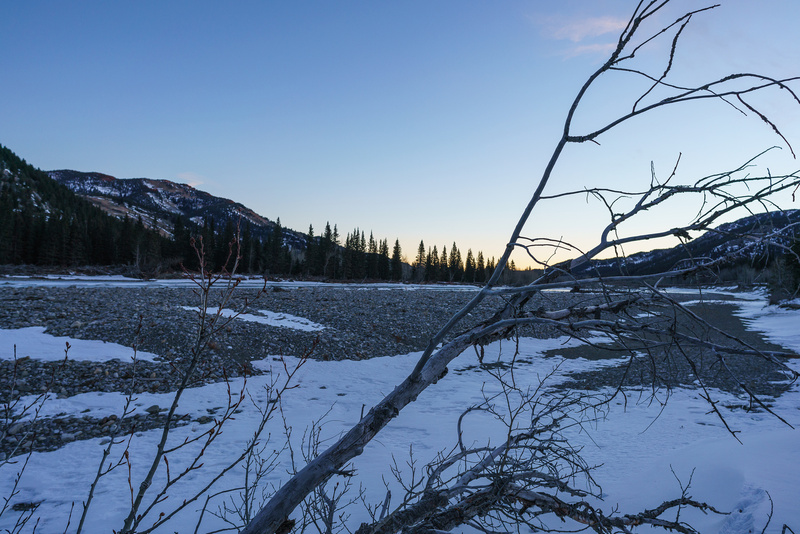 Across the Highwood River looking east along the cold river bank. 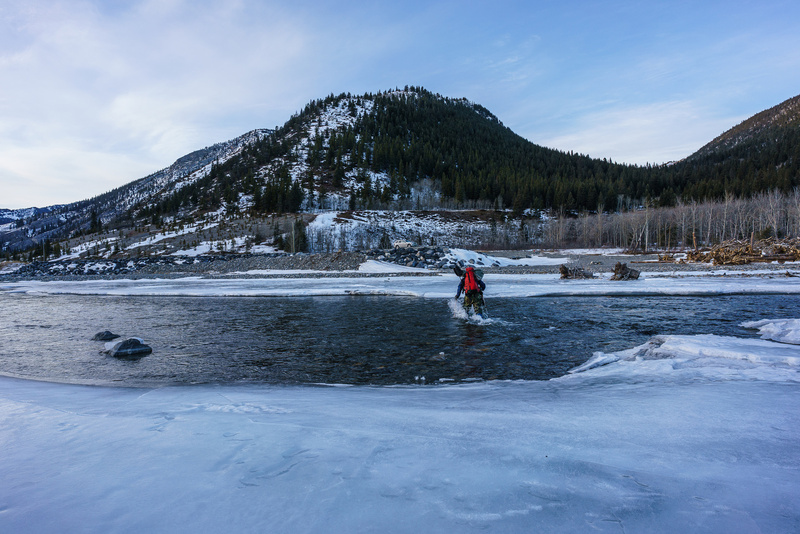 Gearing up for our hike after crossing a frosty Highwood River. Working our way east down the river towards the end of North Limestone Ridge. There was a road / trail running east off the river, here we are crossing Zephyr Creek. 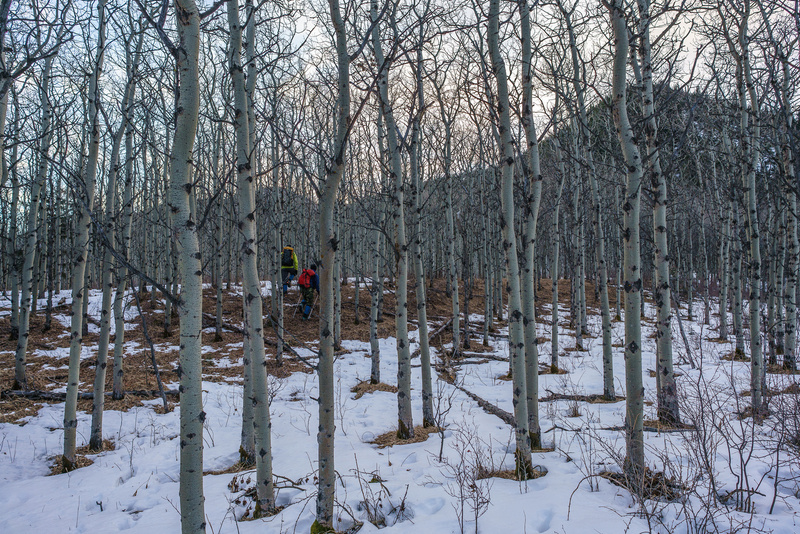 A surprising lack of snow as we make our way through light forest towards the north end of North Limestone Ridge, visible at right. 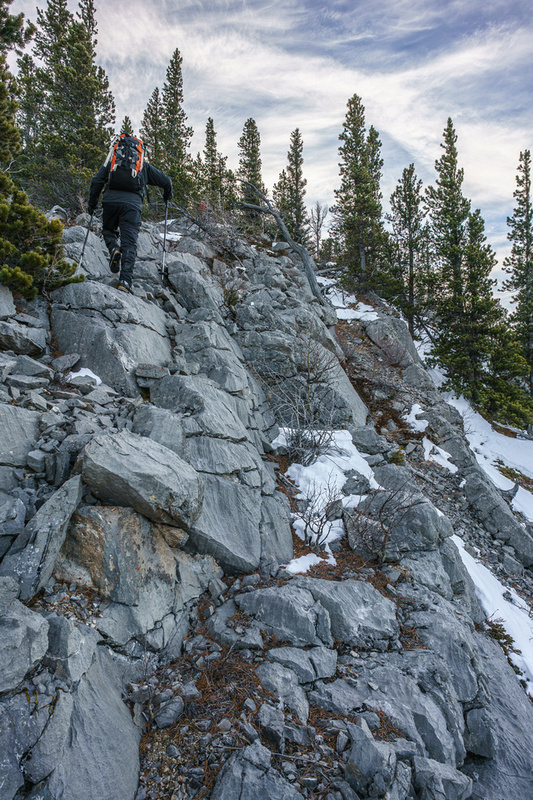 A steep grunt up the north end of the ridge. 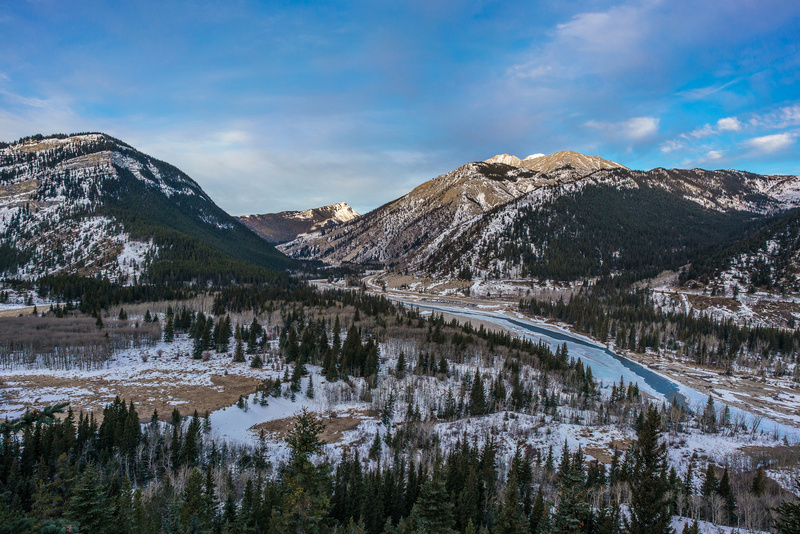 Great morning views over the Highwood River with Mount Mann at left and Gunnery at center. 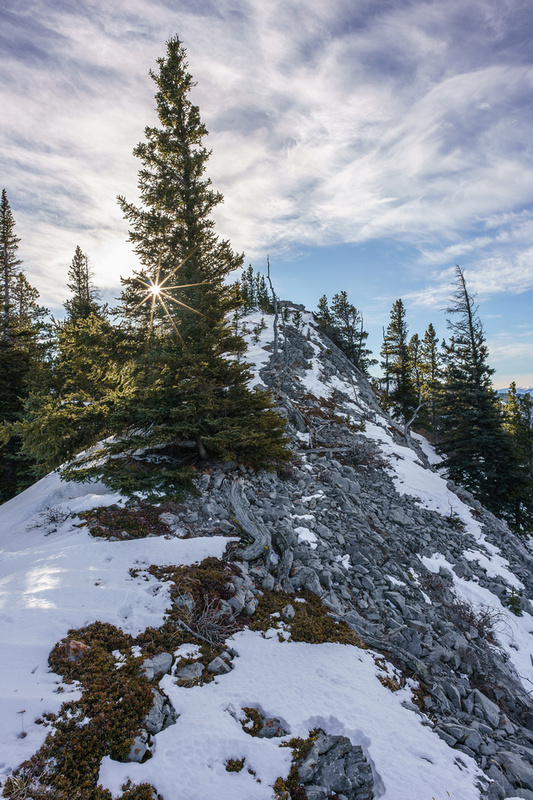 There are some neat scrambling opportunities on North Limestone Ridge if you seek them out. The Limestone ridges made the hiking rather pleasant. 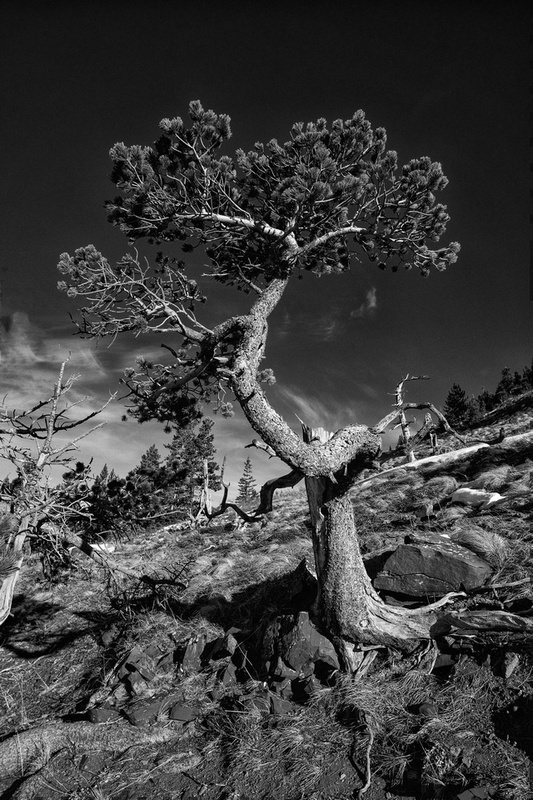 Lots of dead trees provide interesting scenery on the ridge. 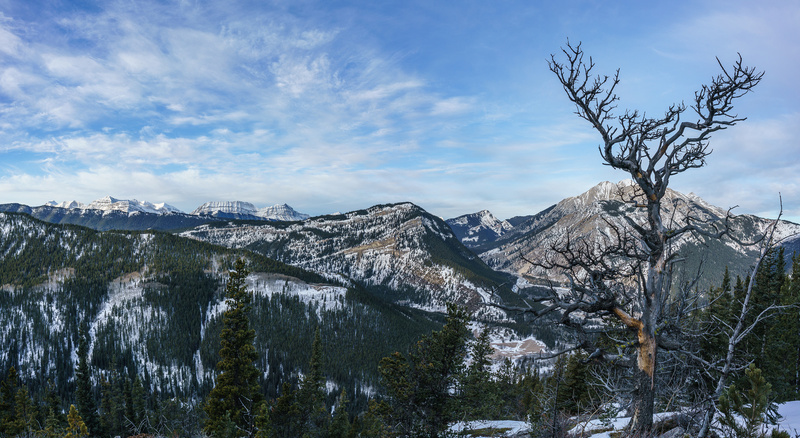 This is looking over at Mount Mann with the High Rock Range peaks showing up in the distance now. 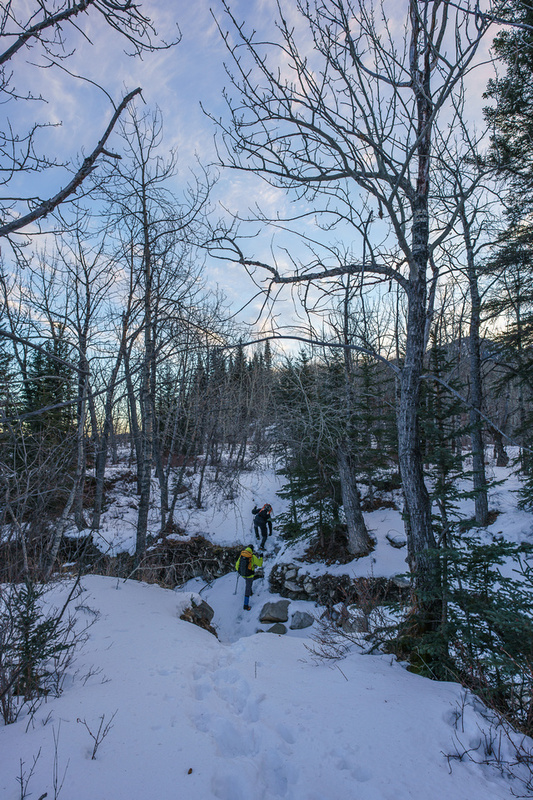 We did some post-holing but snowshoes wouldn't have helped any in the sugary snow. Views back along the ridge to Holy Cross at right with Zephyr Creek at lower center running up valley to the left. With no wind, this was the perfect day to do this hike. Strong west winds would make this considerably less pleasant. Making our way down from yet another false summit and then up the next one. Zephyr Creek at lower right here. A wonderful day to be hiking in the front ranges! Hell's Ridge is the second ridge to the west. 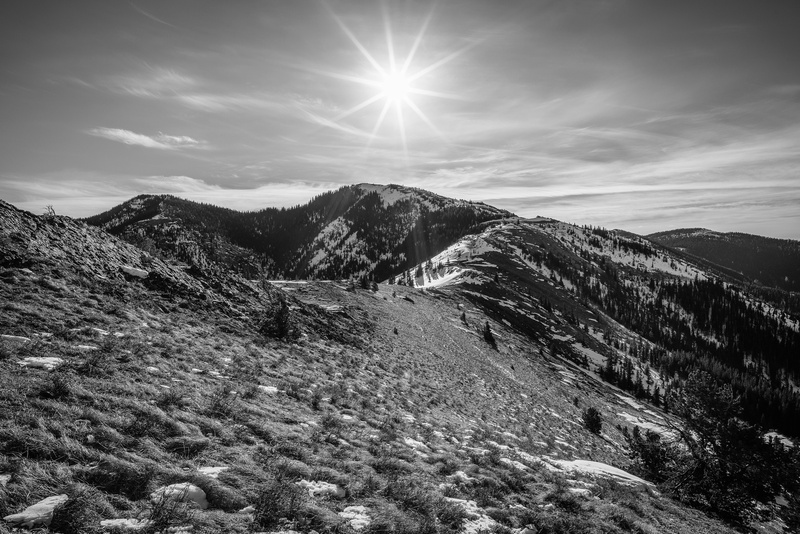 Enjoying my 21mm Zeiss Loxia lens and its ability to make sun stars. Bill makes his way up a fun section of ridge. 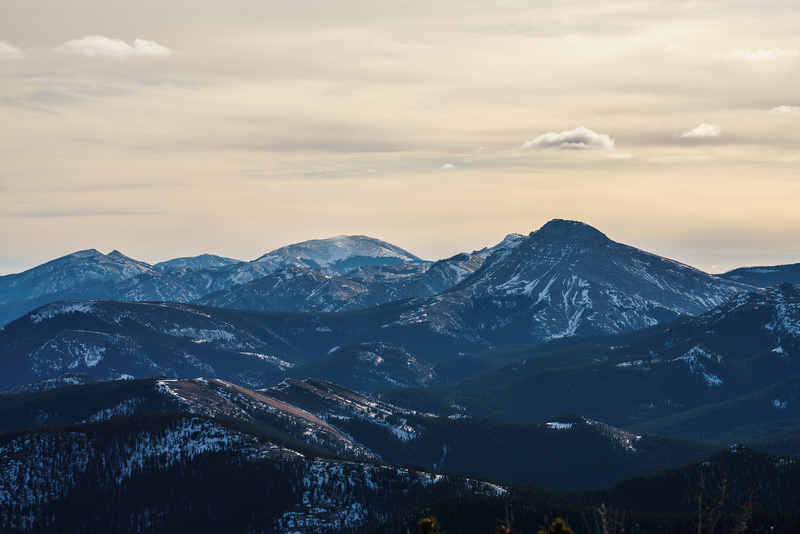 Mount Mann, Cat Creek Hills, Junction Hill, Gunnery, Holy Cross and Bull Creek Hills in the distance. 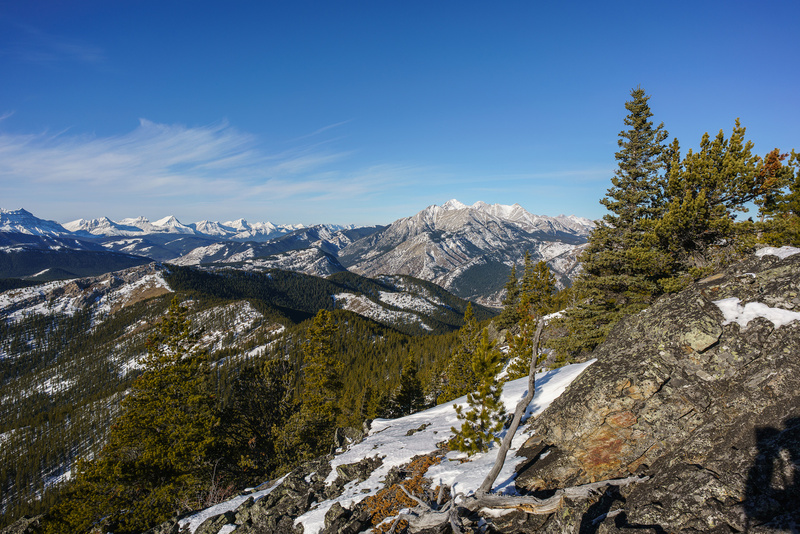 Looking south off the summit of North Limestone Ridge. Our two highpoints for the day are at far left looking a long ways off yet! Dave pointing out peaks to Wietse. From L to R are Bolton, Armstrong, MacLaren, Strachan, Muir, McPhail, Horned Mountain, Bishop, Loomis and Odlum. 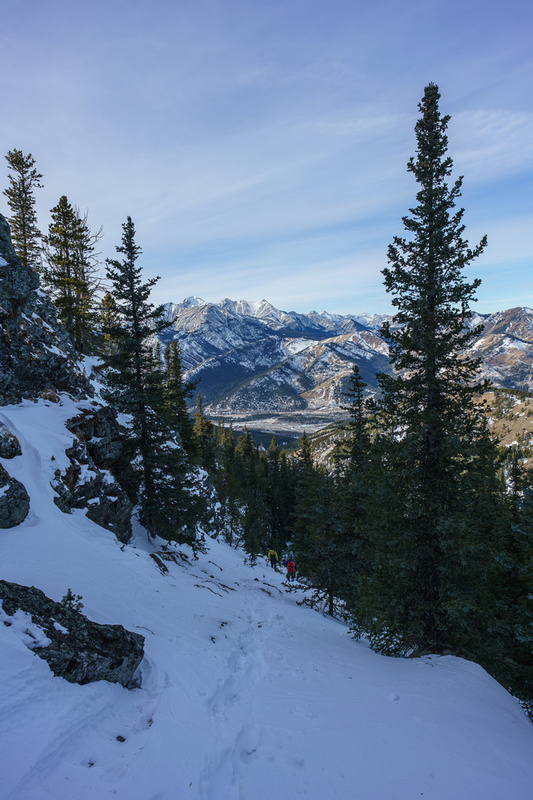 Starting the steep descent down the east face of North Limestone Ridge towards Miller Creek Ridge / Zephyr Creek Hills. Stiff wind slab on top of sugary 'base' made for interesting descents and ascents on steep grassy slopes. Looking back up North Limestone Ridge. We avoided the cliffs above on the right (skiers left) - just in the trees out of sight here. It feels more like spring than mid-winter today! Zephyr Creek Hills at left. 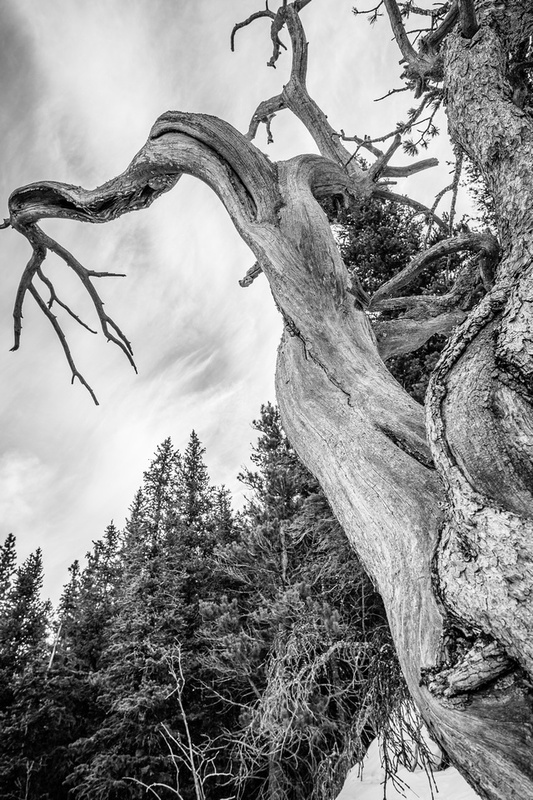 The gnarled, wind-blasted trees make for nice photography. 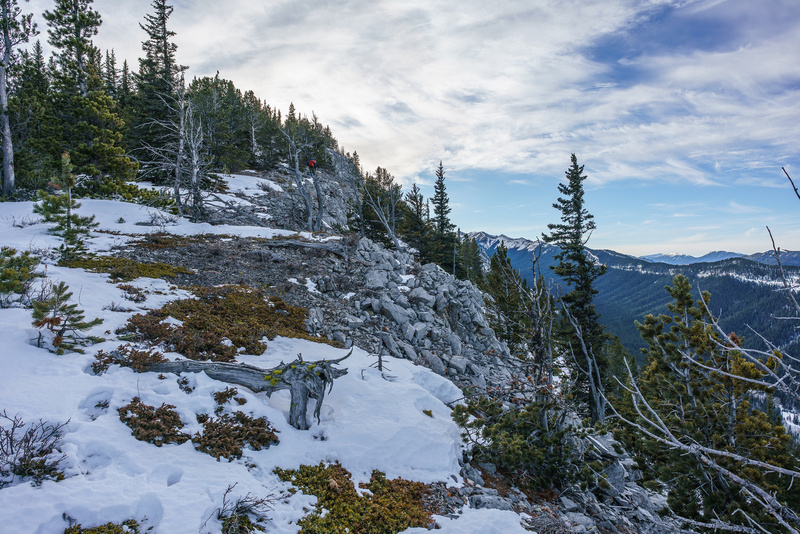 Dave grunts up to Miller Creek Ridge with North Limestone Ridge at left and Holy Cross at distant center. This was a bit of a drag and steeper than it appears here. Gorgeous views off the ridge with North Limestone at lower right. 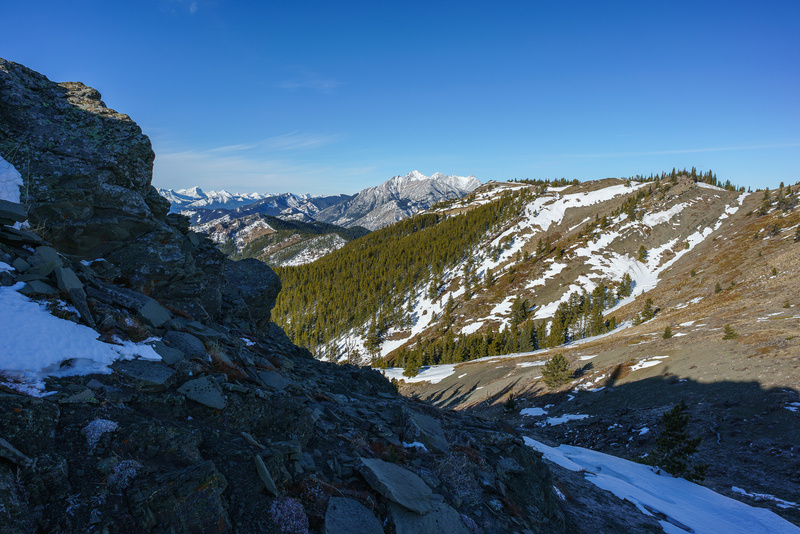 North Limestone Ridge is looking pretty small in this view back along Miller Creek Ridge. You'd think we were close at this point. Not as close as it looks! Looking back along the ridge - North Limestone left of center distance. As you can see - lots of ups and downs. The hint of a trail - it didn't last long. Dave follows me up the first Zephyr Creek Hill - North Limestone at lower center now. The view from the lower Zephyr Hill to the highest one. 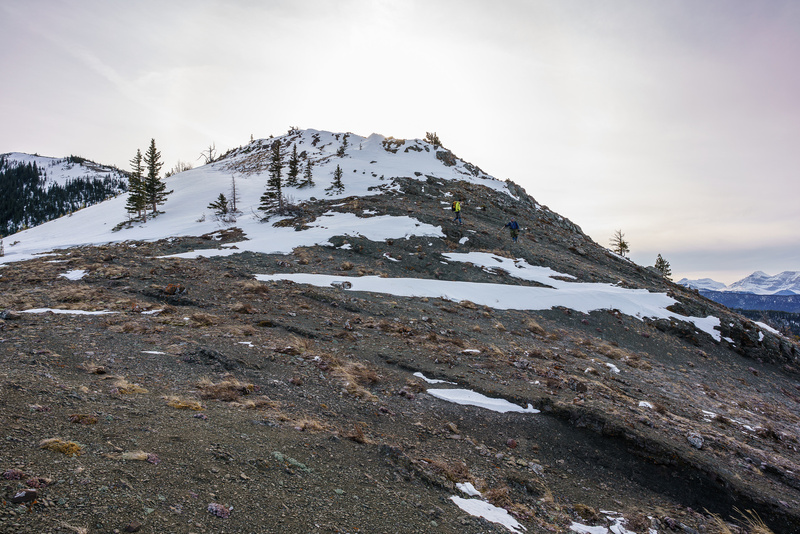 Nearing the summit of Zephyr Creek Hill. 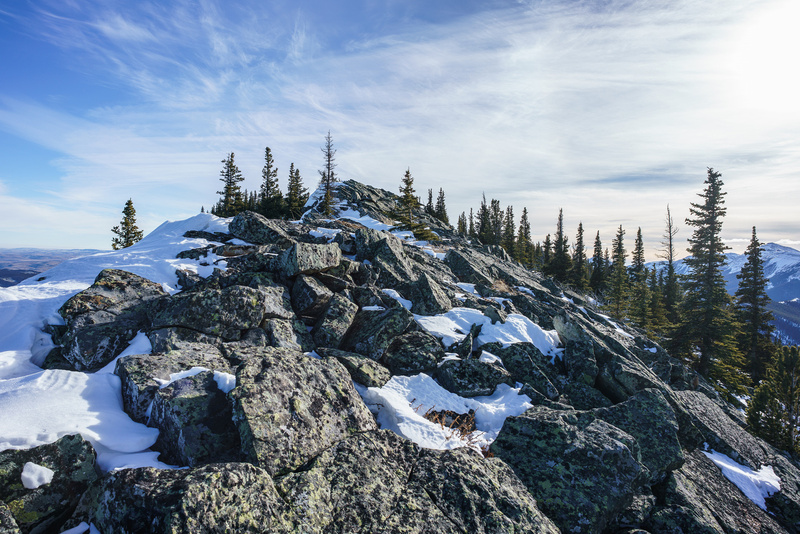 Looking north (L) past the summit cairn towards Holy Cross and Bull Creek Hills and east (C) over the prairies towards Calgary. 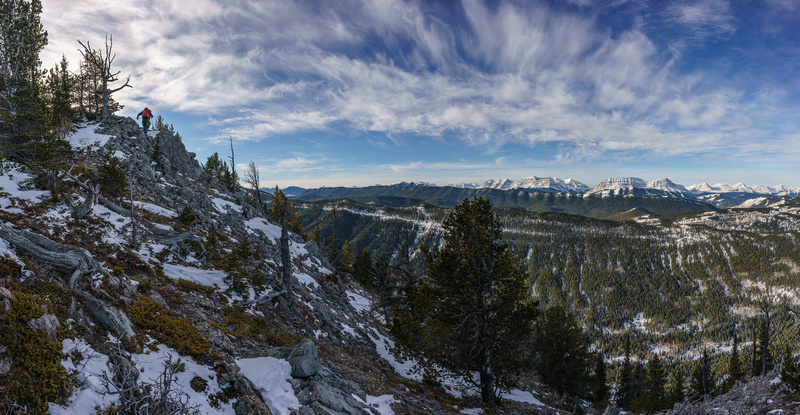 Pano looking south (L), west (C) and north (R). 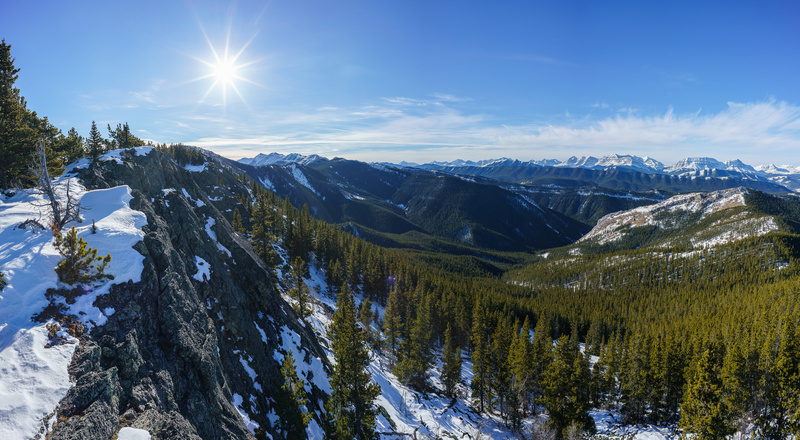 Burke at left, the High Rock Range at center and the Highwood Range at right. Gunnery in the foreground with Holy Cross and Head rising above. 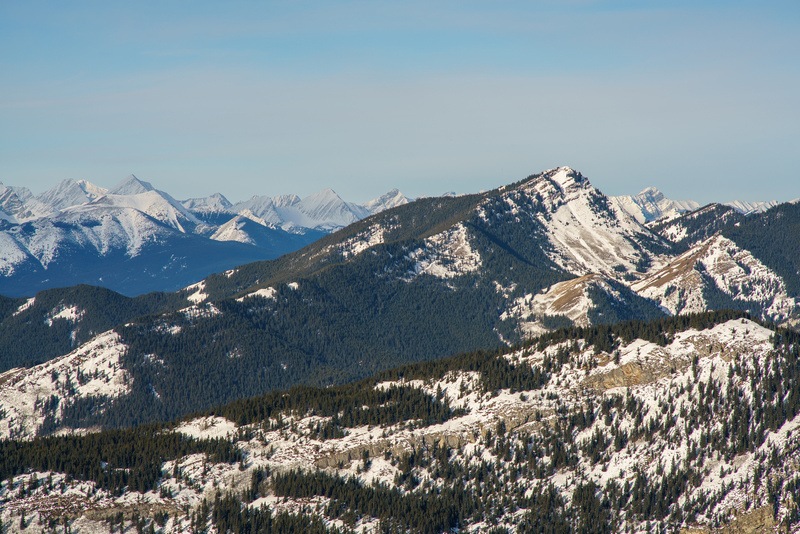 (L to R), Mount MacLaren, Strachan, Muir, McPhail, Horned Mountain, Bishop, Loomis and Odlum, Storelk and Mist. Looking west towards MacLaren, Armstrong, Shankland and Cornwell (R to L). 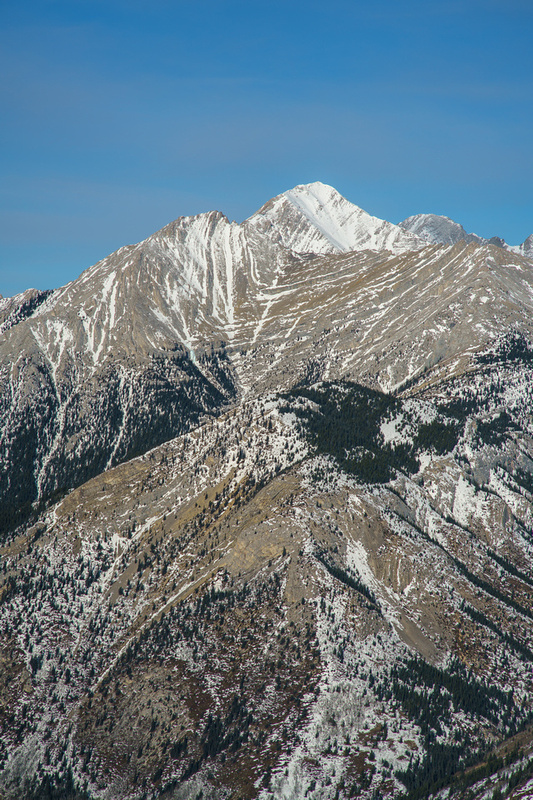 The lookout on Mount Burke, to the south, is visible. 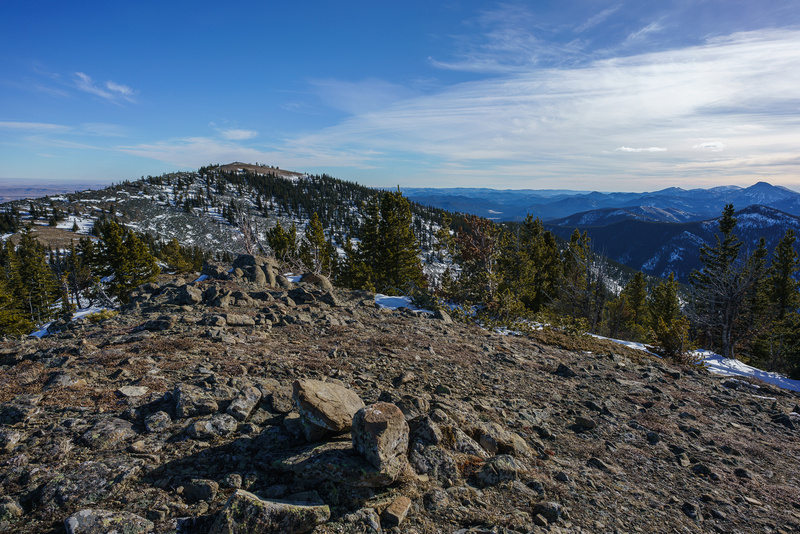 Looking even further south towards Sentinel Peak and Hailstone Butte. Looking over the prairies - Calgary at far right and Eden Valley at lower center. Descending Miller Creek Ridge as the shadows grow long. Wietse and Dave descend another bump along the ridge. 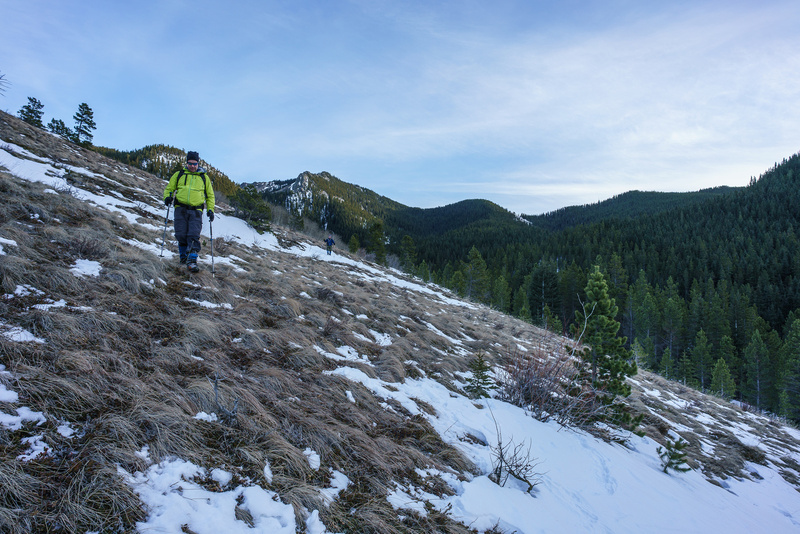 A glance back at Zephyr Creek Hills at the end of Miller Creek Ridge as I ascend yet another bump on the way back. Scrambling right on top of this ridge provided some entertainment. Descending steep slopes on the east side of North Limestone Ridge. Getting off the end of Miller Creek Ridge and looking ahead at our escape valley. 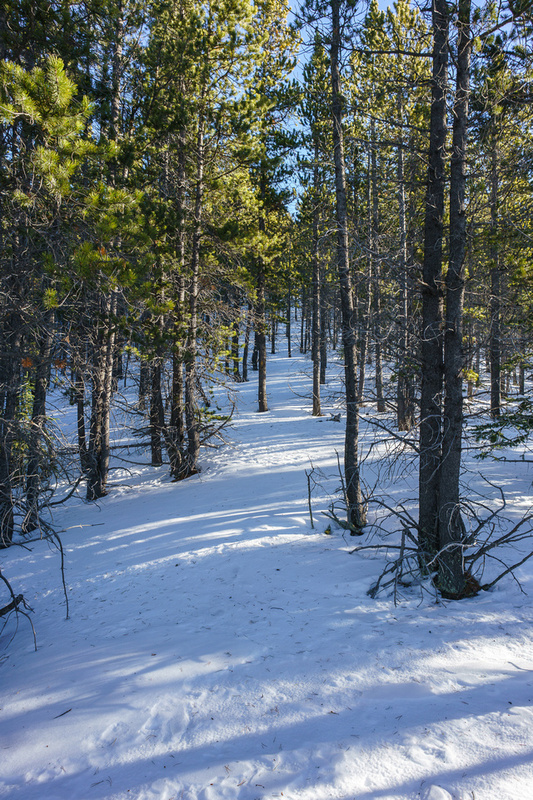 Thankfully the forest was light and the snowpack was thin. In the lower valley - still a ways to go at this point. The end of Miller Creek Ridge just to the right of Wietse's head here. 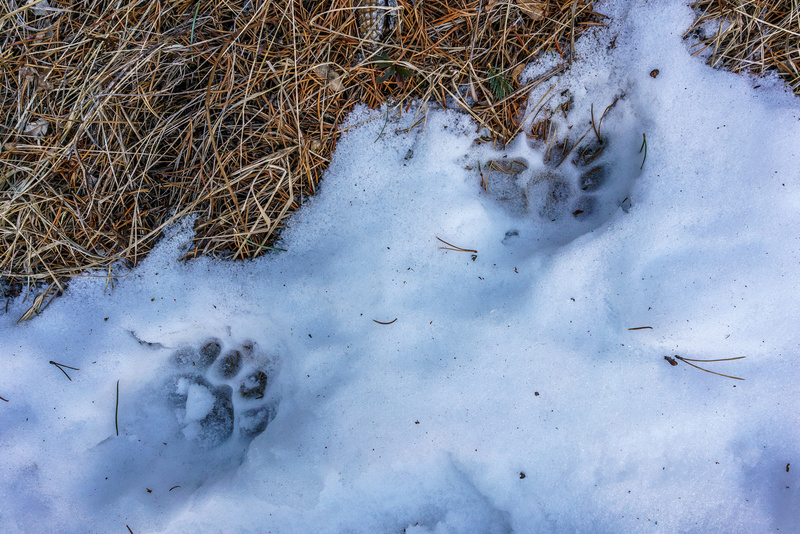 There are cougars in the area - there are stories of hunters being stalked by these cats in this area. 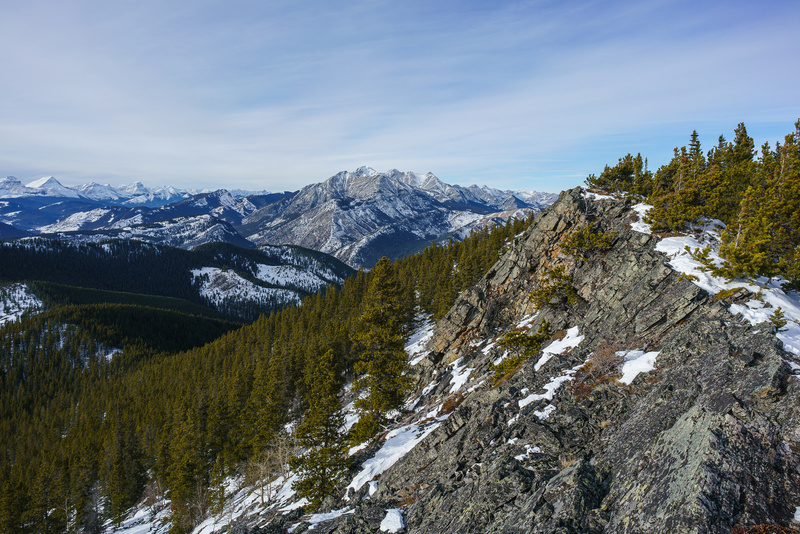 Hiking back along the Highwood River - Mann at left and Gunnery at right. Dave figured that if he ran fast enough, he wouldn't get wet. He was wrong.